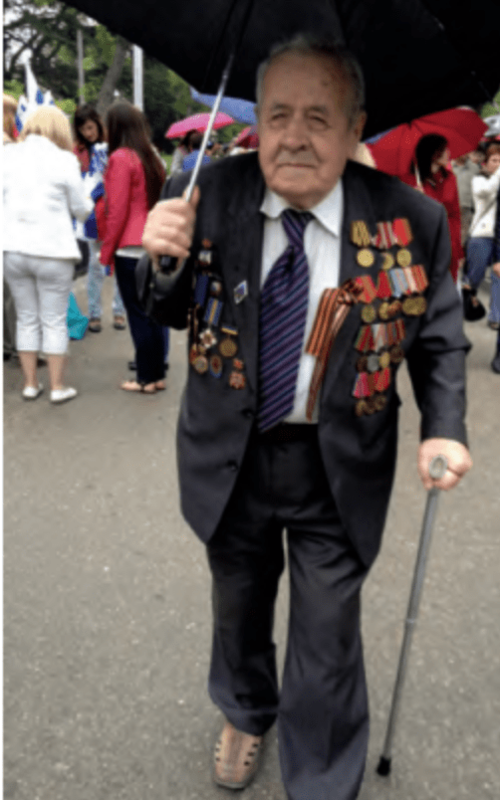 Vladimir Stepanovich Usoltsev (1926-2016), veteran of the Great Patriotic War, noted Sevastopol historian and biographer of Rear Admiral Thomas Mackenzie, shown here on his last Victory Day parade at Sevastopol on 9 May 2014. Brass bands playing, drums beating, crowds cheering and flags fluttering in the light spring breeze – a richly-medalled Red Army veteran, retired marine plant engineer and noted local historian, Vladimir Stepanovich Usoltsev, takes stock of the scene around him. Although eighty-eight years old, and getting frail, he remains determined to join the parade this year. From the forming-up point on Suvorov Square, down the gradual gradient of Lenin Street to the special veterans’ viewing stand at the war memorial on Nakhimov Square is relatively easy going. Many friends and members of his family are present specially to support him. Sadly, his dear wife, Antonina Terentyevna, passed away some eight years before. He can surely make the distance today, perhaps for the last time. He steps off at a careful, measured pace: the veterans are on the march again! Every now and then he recognises an old colleague in the crowd beckoning to him. Vladimir Stepanovich waves back happily. With pride he reflects on the fact that he has taken part in this annual march at Sevastopol for over fifty years. It is Friday, 9 May 2014 – ‘Victory Day’, which is a double commemoration in the Crimean port and main base of the Russian Black Sea Fleet. Soviet forces liberated this ‘city of glory’ from its German and Romanian occupiers on 9 May 1944. Exactly one year later, on 9 May 1945, victory in Europe was declared by the Soviet Union over Nazi Germany. Since the end of the Second World War, both events have been celebrated together in Sevastopol by parades and displays of military and naval hardware. Following the break-up of the Soviet Union in 1991, the armed forces of both the Russian Federation and Ukraine took part, often parading side by side in a demonstration of fraternal unity. Victory Day is the most important event in Sevastopol’s calendar, closely followed by Navy Day. For many of the elder residents, including former naval and military personnel, such as Vladimir Stepanovich, it serves as a reminder of the ‘good old days’ of Soviet power and influence. For the vast majority of Sevastopol’s population and its many visitors on the day, the parade remains a fitting and poignant tribute to the enormous losses and suffering endured by the Soviet peoples during the ‘Great Patriotic War’, some 29 million. Yet today is a very special Victory Day, and the procedure will differ from previous years. It is rumoured that none other than Vladimir Putin, President of the Russian Federation, will be present. Another victory celebration is in the air. As he marches, Vladimir Stepanovich thinks about this remarkable turn of events. The Ukrainian military is no longer present. ‘Crimea is at last fully Russian,’ he muses, ‘and Sevastopol has been liberated again!’ The Crimean Spring has become the Russian Spring. What has occurred has exceeded the veteran’s wildest dreams. Only recently, on 18 March 2014, the city of Sevastopol and the Republic of Crimea were reunited with Russia. Usoltsev himself had written a book about Sevastopol’s founder, Rear Admiral Thomas Mackenzie. In 1783, the Russo-Scot had built the first modern city here during the reign of Empress Catherine the Great. Sevastopol was, and remains, as Russian as the great northern port of Arkhangelsk (Archangel), where Mackenzie reputedly was born in 1740. After half an hour, the veterans reach Nakhimov Square. On gaining their reserved seats, Vladimir Stepanovich turns briefly to his sister, Valentina Fedorovna. He smiles to her and opens his lips to speak, but no words are needed for his bright eyes say it all: ‘joy!’ The siblings then watch the military bands, honour guards and marchers pass, contingents of sailors of the Black Sea Fleet, soldiers, airmen, younger veterans, re-enactors, various groups of workers, young people and school children in their thousands. The procession of smart uniforms, colourful flowers and stirring music appears endless. All are happy. It is such a wonderful, splendid occasion for them and countless other spectators. Yet perhaps a silent minority of Ukrainians in this arch pro-Russian city mourn the manner in which Russia has recently annexed Crimea and Sevastopol. Overhead, modern Russian fighter jets streak over Sevastopol Bay. In the grand harbour below, naval vessels, headed by the flagship of the Black Sea Fleet, the guided missile cruiser Moskva, put on a dramatic display. The delighted crowds cannot recall such a powerful demonstration of Russian military capabilities for many years, perhaps the grandest such occasion since Soviet days. The greatest cheer of the day comes when the President, hot foot from Moscow’s Red Square parade, flies into Crimea during the afternoon. He crosses Sevastopol Bay by naval cutter. Walking up the steps of the Count’s Landing Stage, he then crosses Nakhimov Square, mobbed by the crowd. A chanting chorus of ‘spasibo, spasibo’ (thank you, thank you) greets him. At the vast monument to the fallen of the Great Patriotic War, flanked by veterans of the Black Sea Fleet, the President lays a wreath. It is a moment of both personal and national triumph. 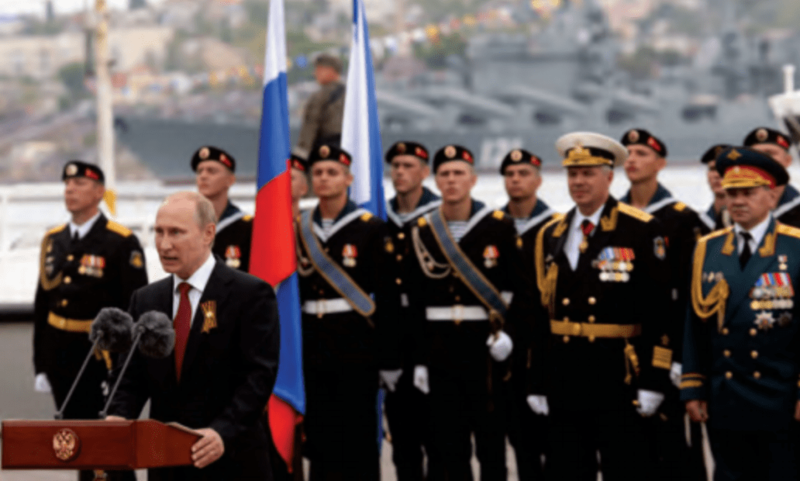 President Vladimir Putin speaking at Victory Day in Sevastopol on 9 May 2014 told a cheering crowd that ‘the Fatherland is embracing you once again as family, as daughters and sons’—reflecting the internationally disputed re-annexation of Crimea into Russia. As they prepare to leave their seats at the end of a glorious day, Valentina Fedorovna quietly says to her brother, ‘I can die now, for I have lived this day’. Vladimir Stepanovich feels exactly the same way. It is indeed the last time that the proud veteran marches on the Victory Day parade.